Connemara Marble Industries Ltd, is Ireland largest manufacturer of Connemara Marble Jewellery and gift items. Our jewellery factory and Visitor Centre is located in Moycullen Village 8 miles west of Galway City on the N59. Our two marble quarries are the Streamstown Marble Quarry at Lettternoosh Clifden, Co. Galway, Cregg Marble Quarry, Cregg Hill, Letterfrack, Co. Galway. Connemara marble is regarded as one of the most authentic Irish products available in Ireland. Geologists estimate that it is about six hundred million years old. The colour and markings in the marble reflects the natural beauty of the mountains of Connemara. 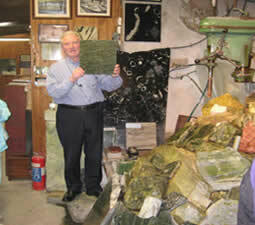 The marble is quarried, fashioned and polished by skilled craftsmen at the Connemara Marble Factory Vistor Centre, Moycullen, Co. Galway.